For most of the homeowners, the cost and the service life of a roofing material matters the most. With so many options available today, they have a choice to make. One of the cost effective and popular roofing in the market is metal roofing. So, whether you are new in the market or not, if you have never considered metal roofing before, it is time that you do that. Unlike the asphalt shingles that have the lifespan of about 15 years or other traditional roofs, metal roofing can last from anywhere between 35 to 45 years with a warranty. A metal roof can withstand the extreme weathers of sun, wind and rain without deteriorating. It doesn’t discompose and if installed correctly can handle any conditions and elements for long term. 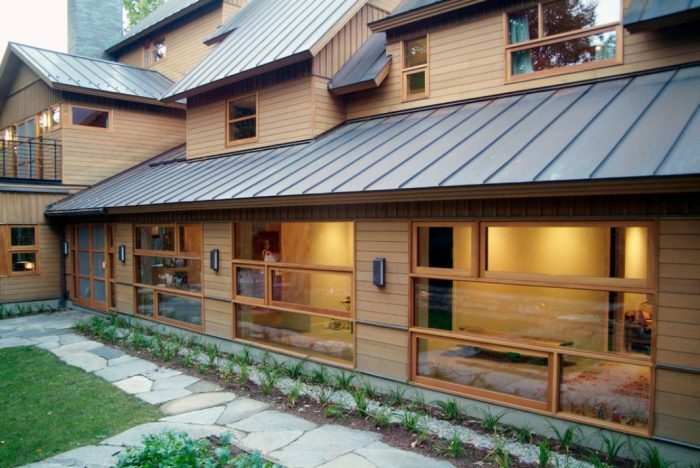 The best way to increase the energy efficiency is to install the metal roofing. The energy transfer and temperature difference can be substantial compared to the shingle roofs. Being excellent insulators, metal roofs will keep your home cooler in summer and the warmth inside the house in winter. This means you can keep your heating and cooling bills down. You just have to make sure that the insulation and roof are properly installed for maximum effect. The purpose of a roof is not only to protect your home from various elements but also to enhance its appearance. Now available in variety of colors and styles, you have a lot of option to choose from. Metal roofs like slate, shingle, standing seam vertical panels, tiles and cedar shakes even give the appearance of other roofing styles. These variety of choices allow you to easily find a metal roof that not only matches your taste but also your home’s style. According to the National association of Homebuilders Research Center, more than 15 Billion pounds of asphalt shingles are dumped into the landfills of U.S., every year. These shingles can’t be recycled and pose a great threat to our environment. However, metal roofing can be easily recycled instead of being discarded. Moreover, by installing a metal roof over the asphalt roof, you can even save the environment more. The 35 to 45 years of warranty of metal roofs, are transferable to the next homeowner, if you ever decide to sell your home. With the costs of roofs constantly increasing, it benefits a homeowner and give him/her a piece of mind that make these roofs an attractive option to go for. In case of asphalt shingles, you have to replace them around 2 to 4 times in the span of metal roofs, that will play a key role in reducing your future costs. The metal roof doesn’t deteriorate easily and is also fire resistant that makes it a safer choice. Furthermore, the added value to your house will be a huge benefit for you. As you can already see metal roofing is a durable, energy efficient and cost saving material that will protect your home for many years to come. Just make sure that you work with a professional on this to get it installed right!